Two of the most common questions marketers are asked today are “What are your Instagram numbers?” and “Are your followers organic?” Without question, in order to be relevant and successful today, traditional marketing campaigns must be matched with a strong social media (and specifically Instagram) strategy. I have personally executed the growth of my company’s brand from zero followers to 255,000. Below are some of the key lessons I’ve learned along the way. Have you ever noticed that when one of your friends doesn’t post for a few days, you wonder what happened to them? Sad but true. It’s just one indicator that social media has become one of the most popular ways to communicate what is going on in our work and our lives. Digital communication, once dominated by email, is now primarily posting and commenting, and it all happens in real time. You receive live updates in milliseconds, and people digest them almost as quickly. To grow on social media, your brand has to capture audiences that are literally swiping up and down feeds within seconds. You must strike consistently, with hard-hitting content. In marketing, we often are advised to follow the rule of seven, which means that a customer has to see an advertisement or message seven times to remember it or to be inspired to take action. When you generate more content, you raise the chances that more people will see your posts. With one caption, you can captivate and engage people and draw them into your brand. If you make sure to be the brand that keeps producing content, you’ll inevitably generate momentum. It’s important to create a strategy that peels away layers with each piece of content you post. In other words, don’t give away everything at once: Walk your audience down a path so that they stay engaged and learn something new every time they see another post. The single most important thing for all brands is the content you put out for people to consume. I recommend investing a lot of your time and resources in making sure the content aligns with your goals. Don’t become stagnant, and remember to mix up the offerings with a variety of staged photos, behind the scenes visuals, short and long-form videos and animated graphics. The possibilities are endless. With thousands of posts on my social channels, I still always find new content to push out every single day. Content can be presented in different ways, but make sure the consumer feels the same way and that the feeling is aligned with your brand identity. Don’t underestimate the importance of creating great copy in the form of captions. When I started writing longer captions that went deeper and told stories, my comments literally went up fivefold. A brand is what it communicates to the public; therefore, it’s vital to be very mindful when crafting your messages. Decide what your brand is and make sure all of the visual and textual components are aligned. To build a successful brand, putting out your true, authentic self will give you the best chance to succeed. I recently started to focus on being more vulnerable by sharing more of my failures than my successes. It has been monumental in building a loyal following that can really relate to my journey. Showing your audience that you are human will go a long way. This is probably the most important lesson. Don’t try to be too many things to too many people. My goal with my personal brand is for people to either love me or hate me, with no fairweather fans. The personalities and companies with the most loyal followings are those that stay narrow because their fan base knows what to expect. Without question, marketers today cannot succeed without incorporating a strong online strategy. 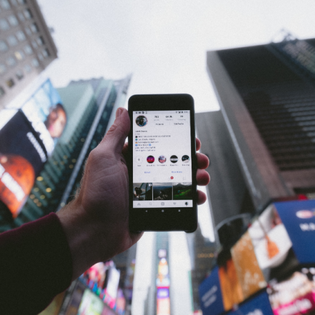 Armed with these tips for Instagram and social media in general, you’ll be able to successfully implement effective campaigns designed to set your brand apart.